What a great month to start this year.. More family time, More books, not hectic and interesting work in the office. I missed writing my gratitude list for December. December was very hectic both in personal and professional life and I felt, time quickly flew away. Thank God, I am back to normal mode now. I feel fortunate to celebrate this special moment. Very good family time. Soo much shopping, planning and fun time with family. We reminiced old days by creating a video(from old photos) of his journey of 60 years. There are many books waiting for my review this month. I have pushed many book reviews from December to this month and I am very much tempted to lock myself in the room for days with minimum food and water ofcourse :p and complete reading those books. Sigh! But, things wont work in that way :-) I could complete 2 books so far and planning to complete one more by this weekend. I have a hunch that I am going to have great time ahead, be it an intuition or something. So, welcomed this new year with bang and planning for the coming months on how I can pursue my old hobby 'classical dance' once again. I know, I have to go through tough time practicing dance again as I have to improve my stamina as well for that. I took a new turn in my perosnal life which gave more clarity on future. Unsure how easy it is to adapt with new changes, but taking a new route this time. I am so fortunate to have my family support. Else, it would have been a difficult journey with kids and work. Also, Linking this to #MondayMusings hosted by Corinne of Everydaygyaan. PS: Image courtesy: From Google images labeled for non-commercial reuse. Congrats Ramya. 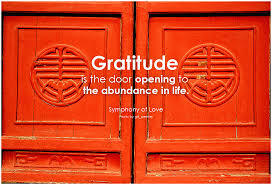 Great post to know about all your gratefulness. Convey my loving birthday wish to you dad and get blessings for us. Thank you for sharing your gratitude list, Mahathi! Each point is beautiful, but I love No.3 - what a great attitude! I wish you all the very best. Do not hesitate to connect for any support I can offer. I am so glad you joined me this month! Stay blessed!